The hands of a master, originally uploaded by photoholic_royd. 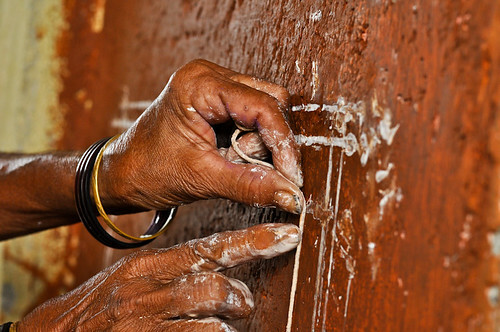 While shooting the documentary, we met a woman named Chapi, who is a Warli painter. While she painted the village school for us, she told us about her life, her children and grand children, her village, and about Warli painting. It was very touching to spend time with Chapi and to learn about a different art form. To know more about Chapi, hang in there for our documentary to be ready. its visually pleasing but it wuldve looked even better if u had captured more of the artwork. cuz now it looks more like experienced skillful hands whereas it culdve been experienced skillful hands creating somehting beautiful.